The finger-wagger extraordinaire has had a very good camp. Eagles cornerback Jalen Mills was reportedly arrested Friday night after getting in a fight with Washington Wizards player Devin Robinson outside a nightclub in Washington, D.C.
MORE: Why do analysts keeping giving the Eagles cornerbacks in mock drafts? "The Philadelphia Eagles are aware of the situation involving defensive back Jalen Mills and are continuing to gather more information. "No further comment will be provided at this time." "Washington Wizards forward Devin Robinson was arrested Saturday morning after fighting a Philadelphia Eagles player at a Northwest Washington nightclub. 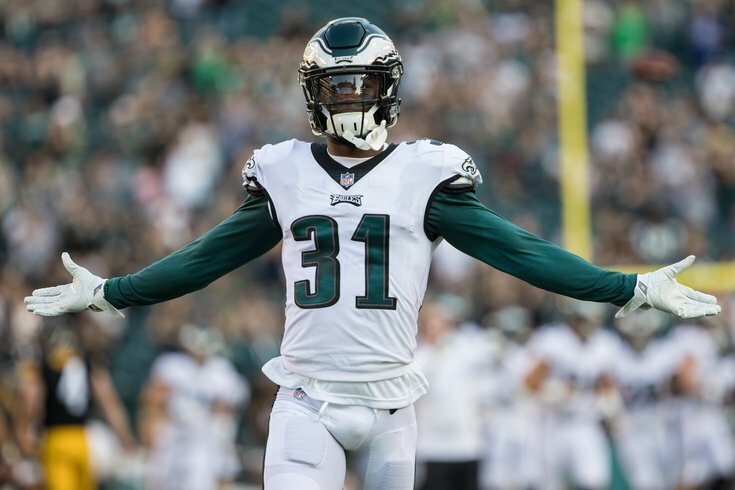 "Robinson and Jalen Mills, a defensive back with the Eagles since 2016, got into a verbal altercation that escalated into a fight on the sidewalk near the Opera Ultra Lounge at 2:56 a.m., according to D.C. police. Both men were arrested and charged with disorderly affray. "Robinson, a 6-foot-8, 240-pound forward from the University of Florida, was transported to Sibley Hospital for treatment. He was then released and taken to the department’s 2nd District station, where Mills was also detained." Mills isn’t the first Eagles player to find himself entangled with law enforcement. In 2016, Nigel Bradham was arrested twice in the same season, once for felony assault and once for carrying a loaded gun into an airport. Also in 2016, Nelson Agholor was investigated for alleged sexual assault but was not charged. Mills, 25, has been with the Eagles since the team drafted him in 2016.